The luxury farmhouse with its light and airy interiors sleeps 10 people and comprises The Old House which sleeps four people and the adjoining Garden House which sleeps six. 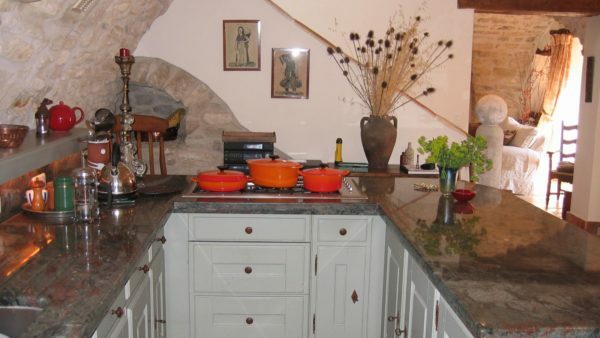 The Old House sleeps 4 people and comprises 2 double bedrooms with double aspect, 2 bathrooms, a vaulted kitchen and a beautiful sitting room. 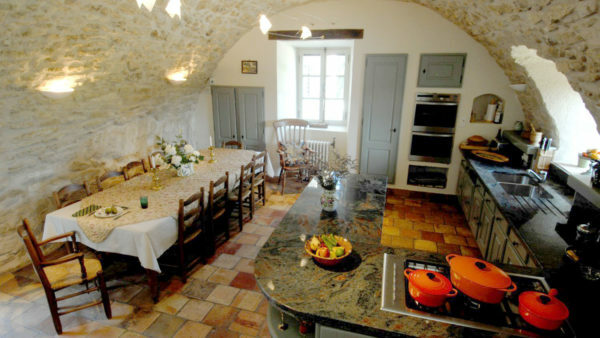 The front door of The Old House opens into a large kitchen with vaulted ceiling and a 12-seater dining table. The kitchen, which is very well equipped for the most discerning of chefs, houses a music centre (iPod compatible), with an extensive collection of mainly classical CDs and, of course, all modern conveniences. There are playing cards and many board games just in case of a rainy day or to escape the sun’s rays. The kitchen opens into the sitting room with a stunning period, open fireplace. 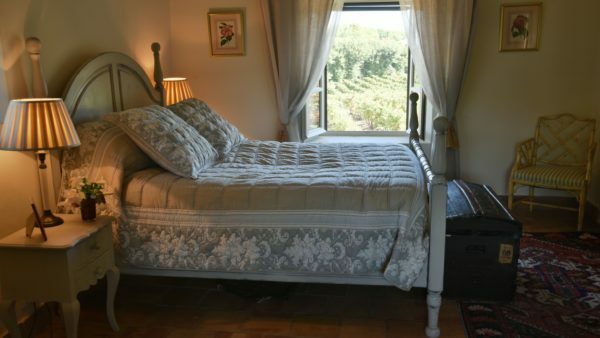 The room has views over the boule pitch and vineyard to the front and french doors open onto the courtyard at the rear. A television with satellite connections offering BBC, CNN, etc and all French channels, is provided. There is high speed internet connection and WiFi throughout. 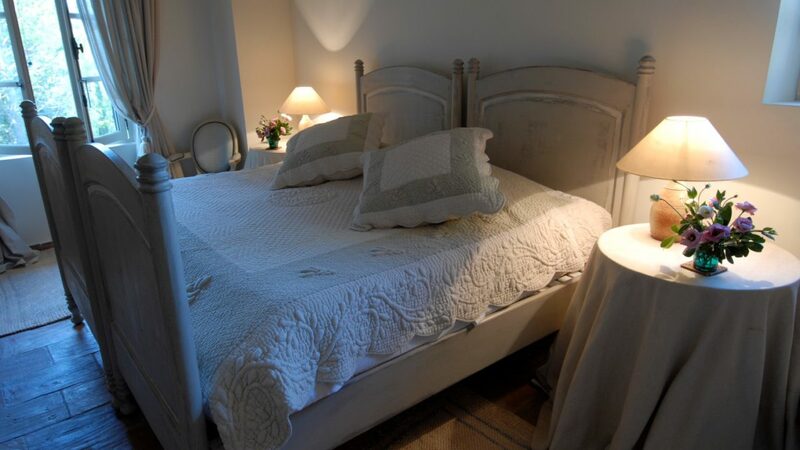 Bedroom 1 with its exposed wooden beams, has a king size double bed and wonderful views over the vineyard towards Mont Ventoux to the front and courtyard and pool to the rear. An en-suite tiled bathroom with walk-in shower and separate lavatory leads off the bedroom. The room is beautifully decorated with eclectic art works creating a sophisticated ambience. Bedroom 2, also with exposed wooden beams, has a king size double bed with similar views to Bedroom 1, a sofa for quiet moments of contemplation and plenty of books to enjoy. There is a separate bathroom with bath, shower and lavatory immediately next to Bedroom 2 on the landing. 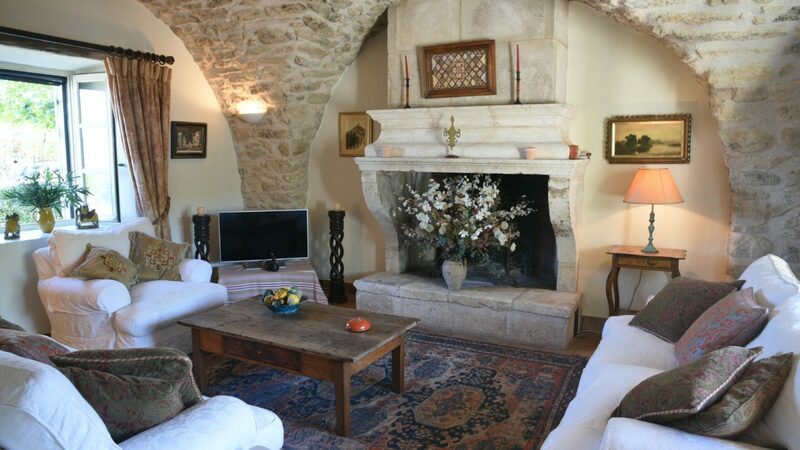 The landing is the area between the two bedrooms and incorporates a huge panoramic window affording breathtaking views across the vineyard and countryside towards Mont Ventoux. The adjoining Garden House sleeps 6 people and comprises an entrance hallway, three double aspect twin-bedded rooms, 3 bathrooms and a second kitchen/utility room. 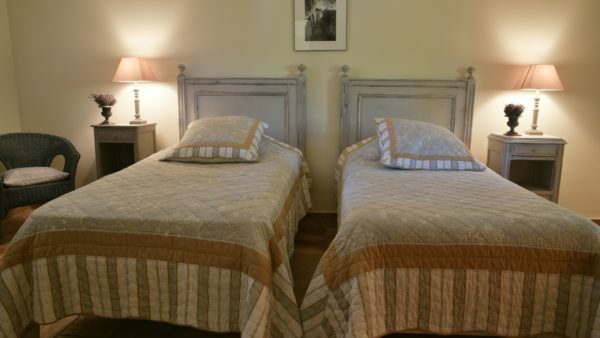 Twin beds can be pushed together to make super-king sized double beds. There is a baby cot and high chair available. 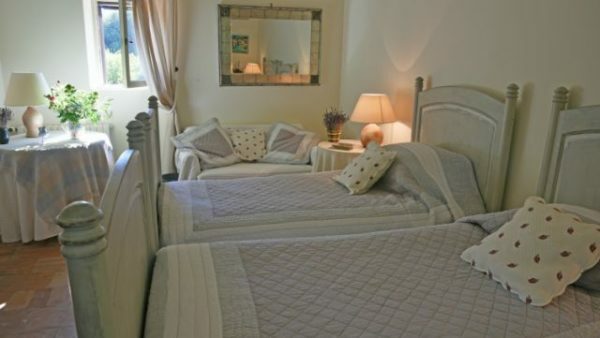 On the ground floor, is a large double aspect bedroom with two single beds, a built-in wardrobe and an en-suite bathroom comprising walk-in, tiled shower and basin. There are views over the courtyard and garden. Between Bedroom 3 and the Utility Room there is a lavatory and basin plus walk-in tiled shower. The hub of the house, the Utility Room, incorporates an additional cooker, two washing machines, a tumble dryer, a large, second refrigerator, a freezer, a microwave and a coffee machine. Terracotta stairs lead to the first floor. Bedroom 4 has exposed wooden beams and is on the left hand side as you ascend the stairs and is a large room with double aspect and twin-beds. There is an extensive wardrobe and views over the garden. Bedroom 5 has exposed wooden beams and is on the right hand side as you ascend the stairs. 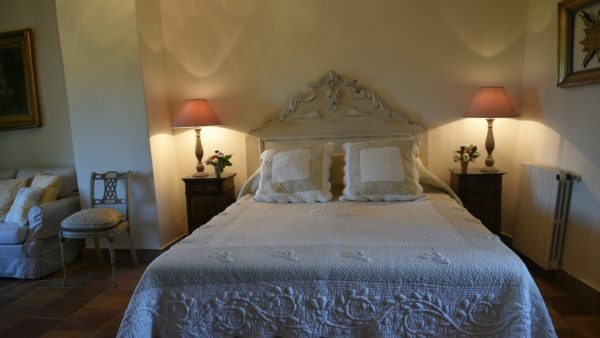 It is a large room with double aspect and, again, is a twin-bedded room with a large wardrobe and views over the garden. Between the two bedrooms on the first floor is a bathroom with basin and walk-in, tiled shower. There is a lavatory adjoining.